Just in case you missed the big news, Office 2016 for Mac (version is 15.11.2) was released to Office 365 subscribers. If you have a subscription for Office 365 software, you can download Office 2016 from account's download software page. The Public Preview will expire on August 9, as will the RTM installation for non-subscribers; the Enterprise volume licensing and retail perpetual licenses will be released within a few weeks. Current version (as of August 13 2015) of Office 2016 for Mac is 15.13.1. My favorite new Outlook features are the ability to view calendars side by side or overlaid, just like on the windows version. You can also propose new meeting times (if using Office 365 Exchange or the new Outlook.com). Office for Mac looks like Office for Windows, but how similar are they under the hood? Closer than with older versions, but still far apart. Want to request Read receipts? Forget it. Voting buttons? Message Recall? Ok, message recall gets a pass since it doesn’t work all that well on Windows either. Mailtips and other informational messages such as mailbox quota? Nope. VBA? No. While you can't sync Outlook.com calendar and contacts to Outlook 2016 for Mac right now, after the Outlook.com accounts are moved to Office 365 hosting, you can add the outlook.com account as an Exchange account and everything will sync. 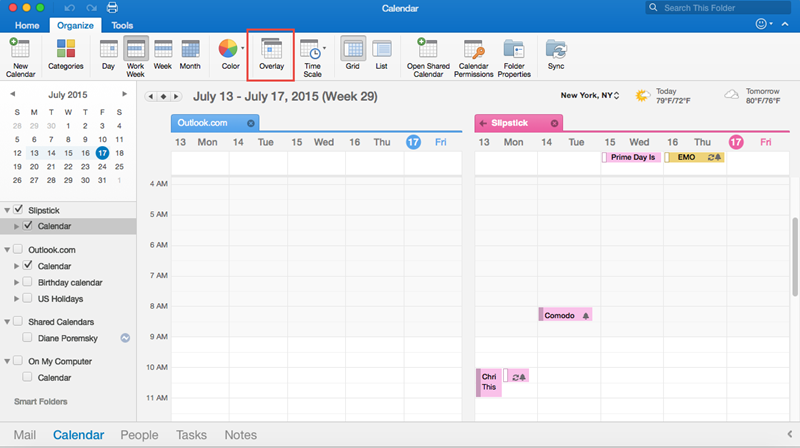 See Compare Outlook 2016 for Mac with Outlook 2013 for Windows for a chart full of comparisons. Yes, there are a lot of No's on the Mac side, but they are making slow but sure progress. implementing, and maintaining Outlook 2016 for Mac in their organizations. for the ones you like. Does this mean I won’t ever be able to import my current Outlook 2016 files into a newer Outlook version in the future? Mac Outlook can import windows Outlook pst files, but it cannot export to them. I wouldn't say 'never' but yes, at this time (and for the foreseeable future), your options for exporting the data on a mac are limited. It's probably best to use a server side account like IMAP, Exchange, or Outlook.com. I am using Outlook for Mac, version 15.17.1 (151217) and I have been trying to get the single line view in email. I generally have the Reading Pane to the right and want the single line view...all I need is the sender, subject and date sent. Can this be done in this version of Outlook for Mac??? as far as I know, you can't use a single line view on the mac's outlook. The view options are pretty limited - you can turn off preview to reduce from 3 lines to 2 but can't drop to 1 line. Hello - I just upgraded to Office 2016 on my business MacBook Pro. In Outlook, I'm seeing a change that hopefully can be fixed - when a colleague forwarded a message that I need to handle, I do not see the email address from the original sender. Is there a way to change this so I can see all the email addresses displayed? Thanks! There seems to be an issue that many people are having with reminders coming from shared calendars. For example, if Bill accesses Sue's calendar through Outlook 2016, some of Sue's events (including events that Bill is not invited to) may show up in Bill's reminder list. Some of these reminders cannot be dismissed. It is possible to blow away Bill's profile and start from scratch with a new profile on the Mac/PC, but eventually, some events from Sue's calendar will start showing up and not be dismissible. Interestingly, these typically will be different events than the ones that got stuck in the first profile. There are a bunch of reports of this on the 'net, but no permanent, reliable solution as of this writing. I would like to know if in Outllook 2016 for Mac I have the option of view selected dates only! This option is available on Outllok 2013 for Windows - I can not fid a way to display selected dates on it. No, it's not in current versions. Sorry. Next to outlook.com contacts and calendar sync doesn't work I experienced that also Gmail contacts/calendar support is not taken care of in office365/outlook 2016. Is there any sight when outlook.com is ging to be moved into the Exchange set-up in the 365 cloud env? Yeah, outlook still doesn't sync with either gmail or iCloud calendar and contacts. Last I heard, they are still planning on having all accounts moved to office 365 by the end of the year. I just installed office for mac 2016 and find the calendars and contacts don't sync because the outlook.com account can only be accessed via IMAP. Do you have any update from MS on when accounts will be moved to the office 365 version?